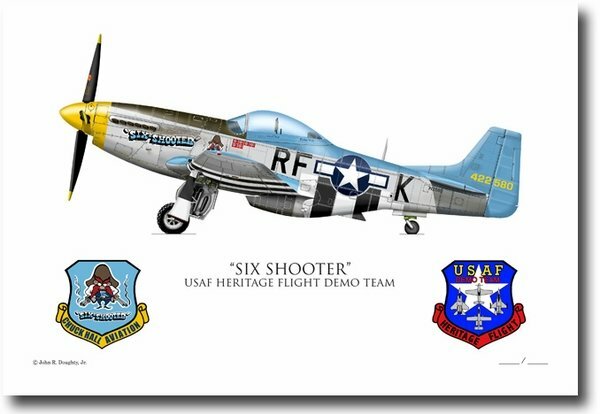 The P-51 Mustang (specifications) "Six-Shooter" (44-22580) was rebuilt after World War II by the US military and was sent to the Bolivian Air Force as a counterinsurgency aircraft. The aircraft was returned to the United States, and Chuck Hall purchased the P-51 in 1995. For 10 years, Chuck Hall has flown his P-51 Mustang "Six-Shooter" as part of the United States Air Force Heritage Flight Demonstration Team, averaging 18 air shows per season. He is one of only a few civilian pilots in the United States of America qualified to fly propeller driven fighters in formation with USAF jet fighters. He retired from the USAF Heritage Flight Program in 2008. Chuck Hall is a member of the Society of Experimental Test Pilots, with over 30,000 flight hours in commercial and military aircraft, and 2,000 hours in warbirds. He has flown the Douglas DC-4, DC-6, DC-8, DC-9, Lockheed L-1011, C-130, Constellation, F-104, Boeing B-707, B-720, B-727, B-747, Convair 880, Curtiss C-46. While he was in the US Army, he flew the Bell H-13, and the Sikorsky H-19 and H-34 helicopters. He has also flown the following warbirds: the Grumman F4F Wildcat, F6F Hellcat, F8F Bearcat, Curtiss P-40 Warhawk, Vought F-4U Corsair, Douglas A-1 Skyraider, and the P-51 Mustang. He has flown in the USAF F-4 Phantom, F-15 Eagle, F-16 Falcon, and the US Navy F-18 Hornet at Top Gun.